I am thrilled to report that fresh rhubarb has arrived. That means fruit pie season has officially begun! To mark the occasion, I wanted to make a fancy rhubarb pie with a show-offy crust. I found started poking around on Martha Stewart's website for some inspiration and found this instead — an easy and delicious-sounding recipe for adorable mini tarts made with frozen puff pastry. Martha used strawberries along with the rhubarb, but I left those out since it was the tart and tangy experience I wanted. I also added a honey drizzle at the end because I have a maniacal sweet tooth. If you don’t, feel free to skip that part. These are so quick and easy I made them after cleaning up dinner last night. The recipe is also a great one for kids to help with. 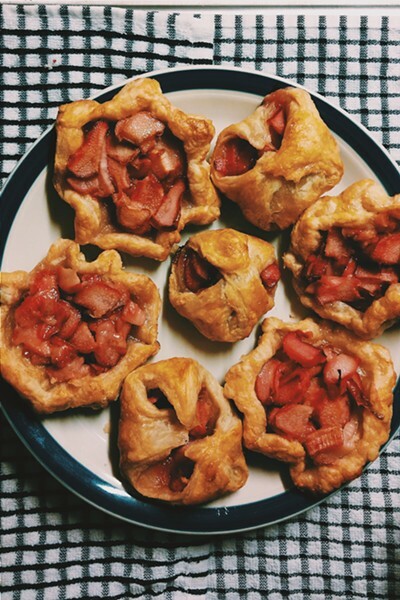 My 4-year-old, Sadie, helped combine the rhubarb mixture and pinch the pastry around the filling. An older kid could easily handle the prep entirely on his or her own, with rhubarb-slicing supervision, of course. When shopping, look for rhubarb that's nice and bright, with firm, crisp stalks and no blemishes. if the leaves are still attached, make sure they look perky and fresh. Make these for a special weeknight dessert. After all, spring produce is something to celebrate! Roll out your pastry dough on a lightly floured surface until it’s about 1/8-inch thick. Using a sharp knife or pastry cutter, cut out several 5-inch squares. I used 2 sheets of pastry and got 10 squares, plus a little extra. Lay the squares on a parchment-lined baking sheet and set aside. To make the filling, mix the sliced rhubarb, sugar, salt, cornstarch and flour in a large mixing bowl until everything is incorporated and the rhubarb is releasing some juice and dissolving some of the sugar. Spoon about 1/4 cup of the rhubarb into the center of each square, then fold the edges in and crimp in a few spots to keep them from opening. Brush the edges with a little bit of egg white and sprinkle with sugar. Pop the whole tray into the freezer for about 20 minutes, or until the pastry feels very solid. Then, put them straight into the hot oven. 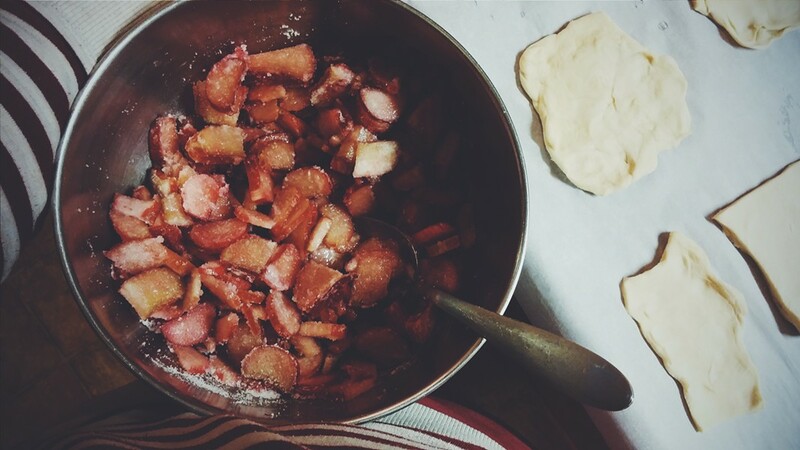 Bake for 30 minutes, or until the pastry is puffed and golden brown and the fruit is bubbly. Let cool for a few minutes, and drizzle with honey before serving. Serve with fresh whipped cream or ice cream if you like.